... so what determines if an etalon is 1, 0.8 or 0.65 A. Everything you always wanted to know about Fabry Perot etalons but were afraid to ask. A FP etalon is a type of “interference” filter which uses two highly polished, exceedingly flat, and precisely spaced partially reflective mirrors facing each other to achieve an ultra-narrow bandpass of usually less than ~ 0.1 nm (1 Ångstrom). The gap between the mirrors can be either solid or open (air-spaced). Light entering the etalon is reflected in the gap and resonates back and forth, and depending on the wavelengths being in or out of phase, can either be reinforced or destroyed – e.g. constructive or destructive interference. 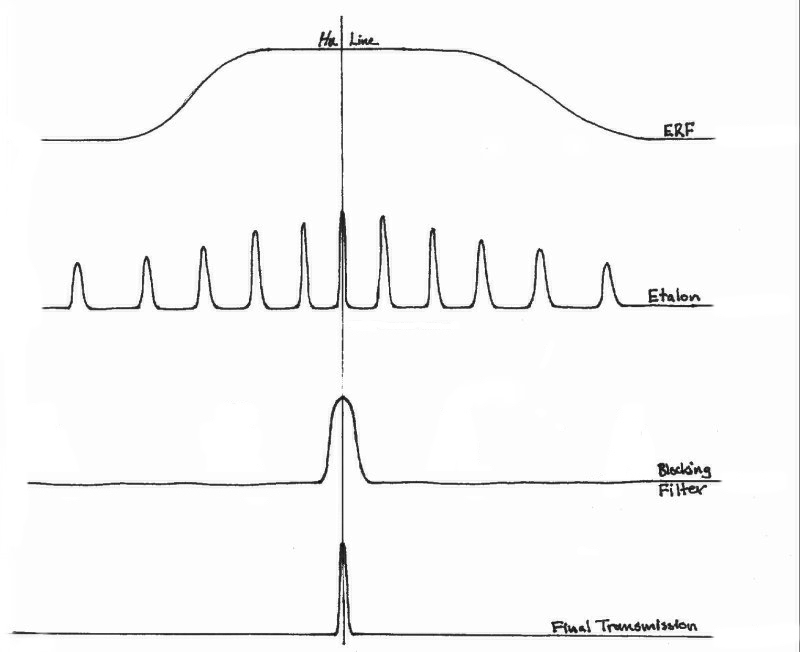 Peak Transmission – Depending on the spacing of the etalon plates (gap thickness), various wavelengths can be selected, with their associated harmonics falling on either side of the desired wavelength of light. This spacing of solar filter etalon plates generally needs to be changed in order to “tune” the etalon, which shifts the etalon peak to account for environmental conditions, or allows better viewing of off-band phenomena. Solid etalons usually do this by changing the etalon temperature, and thermal expansion and contraction changes the spacing of the mirrors; or tilting the etalon, which results in a greater path-distance for light to travel between the etalon plates. Air-spaced etalons can change the spacing by several methods: tilting as just described; pressure tuning, which changes the air density – and hence gap refractive index -- and slows down the light making it “feel” as if it is going a longer distance resulting from increased air pressure/density; or mechanical pressure on the etalon spacers which changes the etalon plate separation. Bandpass -- technically referred to as the FWHM - full-width half-maximum - is the width of the transmission profile at one-half of the filters maximum transmission at the design frequency/wavelength, usually denoted in Ångstrom units for solar filters. For solar applications, narrower is generally considered to be better. Bandpass is a function of the size of the gap between the reflective surfaces, and the reflectivity of the mirror coatings: The larger the gap, or the higher the reflectivity, the narrower the bandpass. However, as one might infer, the higher the reflectivity, the less the transmission: at 100% reflectivity no light would pass through, and at zero reflectivity there would be 100% transmission, but no interference, and hence no narrow-band filtering. The reflectivity at the desired wavelength is therefore chosen somewhere in between, and usually results in a peak transmission of around 60% for a single etalon. Etalons can generally be made down to a FWHM of 0.03 nm (0.3 Ångstrom) but will be rather dim in overall view when this "narrow." Narrower bandpasses can also be achieved by “stacking” multiple etalons, but the overall transmission will also be lowered. For example: the practice of double stacking two etalons with 60% transmission will have a combined transmission of 36% (0.6 x 0.6 = 0.36). Free Spectral Range -- the distance between the harmonic resonant peaks passed by the etalon. The smaller the etalon gap, the wider the FSR becomes. If the resonant peaks are too close together, they become harder to block using standard dielectric interference filters, and therefore the blocking filters become more expensive to make. Therefore the FSR is usually chosen to be around 1.0 nm (10 Ångstroms), and this value aids in keeping the out-of-band continuum light from getting through via the blocking filter. Finesse -- defined as the ratio between the the FSR and bandpass, and the higher the better. An etalon with a finesse of 2 has a very broad and flat transmission curve, with a lot of out-of-band leakage and poor performance. An etalon with a finesse of 30 will have a very tall and narrow transmission curve with very good perfromance and virtually no out of band leakage. The typical solar etalon with a bandpass of 0.7 Ångstrom and FSR of 10 Ångstroms would therefore have a theoretical finesse of ~ 14 if perfectly made. This is where the optical flatness and parallelism of the etalon plates is of critical importance in the filter performance. When these are less than ideal, the noise floor of the etalon transmission curve rises significantly above zero, and background glow begins to be visible and interferes with faint prominences and low contrast disk detail. So once we have established the basics of reflectivity and gap spacing, we can determine the filters bandpass. But this is a theoretical value only. Several issues can render the bandpass specification almost meaningless, such a the previously discussed etalon flatness, parallelism, and resulting finesse. Another major factor to consider is the nature of how light passes through the etalon. An etalon only performs ideally with perfectly parallel light passing through it normal - or perpendicular - to the etalon plates. Most eltalons have another specification known as the “acceptance angle.” The acceptance angle is the angle away from normal (perpendicular) to the etalon that a ray of light can deviate and still be within the specified bandpass. As described above for tuning, as a light ray begins to deviate away from normal through the etalon, the path length through the gap increases, and the transmission peak is shifted toward the blue end of the spectrum, and the bandpass begins to widen as well. If the ray exceeds the acceptance angle, the filter falls “off band.” This has very important consequences for etalon design and placement. If the sun were a point source of light, all would be easy. Unfortunately, the sun is a rather large object subtending a half a degree. When placed on the optical axis of a telescope, light from the sun’s disk center will be exactly normal to the etalon, but light rays from the sun’s limb will subtend about 1/4 a degree before it even enters the telescope. With a front mounted etalon, this usually is no problem, as the acceptance angle for a 0.7 Å filter is usually about half a degree, and the entire disk remains on band. A front mounted etalon using tilt tuning therefore has about another 1/4 of degree or so of tilt available for tuning before the filter will begin to shift off-band, and therefore contrast uniformity is minimally affected. And we can now see why an etalon placed on the front of an objective has the best possible performance – there are no instrument angles to contend with, and the etalon deals only the field angle of the sun’s limb - which is low as can be obtained. However, as filter size increases, it becomes increasingly difficult to make with good flatness and parallelism, and the practical limit is based on funds available to achieve an acceptable finesse. For this reason, etalons are rarely made larger than about 15 cm (six inches) in diameter. As smaller etalons are more easily (economically) made to an appropriate finesse, an alternative placement is within the optical system behind the objective. This is usually done in one of two ways: via a collimator lens system or a telecentric lens system. However, one or both of these systems can introduce additional ray angles to contend with in the form of instrument angles and magnified field angles, which can degrade etalon performance, especially when these angles exceed the etalon acceptance angle. Using tilting for tuning the etalon only exacerbates the situation, and that is why pressure tuning or mechanical pressure tuning are much preferred. These issues can result in poor contrast uniformity, “sweet posts,” and “banding.” Properly configuring and optimizing the placement of an internal or rear mounted etalon is therefore supremely important if one is to realize the maximum filter performance possible. Lastly, another word about double stacking: As previously described, double stacking is used to decrease filter system bandpass, and this also results in a reduction in overall transmission. However, the filter becomes a “double cavity” filter verses a single “cavity,” and the transmission curve will be narrower and have greatly suppressed "tails" compared to an equivalent single filter with the same bandpass specification and finesse. A double stacked pair of 0.7Å filters will have a bandpass of ~ 0.5Å, but a transmission profile of a much narrower (higher finesse) filter. This keeps out-of-band energy from degrading contrast, and therefore the transmission profile of a solar H alpha filter system seems equally if not more significant than a bandpass specification alone. A comparison from George 9 of transmission curves, showing the improvement stacking of multiple filters provides. The transmission peaks have been normalized to better the comparison. While bandpass is reduced significantly, note the vast reduction in the filter "tails" from single to double stacking 0.7 Å filters. While triple or quad stacking offers a marginal improvement in both bandpass and tail suppression, in reality they would also have drastically reduced peak transmissions. This representation, also from George 9, shows the difference between filters with an identical FWHM bandpass, but using a different number of "cavities." 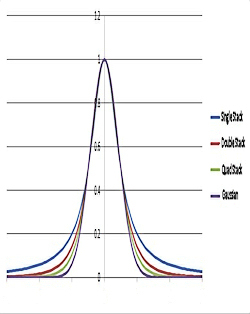 The blue curve is a single stacked filter, the red curve is a double stacked filter, the green curve is a quad stack filter, and the purple curve is and ideal Gaussian curve. Again the transmission peak is normalized. Edited by BYoesle, 02 November 2014 - 07:54 PM. OK I have a question. What are they used for? And why do you need to tune them? Never thought about observing the sun but now ... BTW I'm fine with the theory and practice of etalons (though in my neck of the woods we usually use cm-1 or MHz) so no need for further explanation there. I just have no clue what you would use them for in this context. Nice recap, btw. thanks for the Fabry Perot etalon post. so much to learn in this fascinating hobby, but it's all good. Would that be for RAdio hydrogen resonance? What are they used for? And why do you need to tune them? Narrow band optical etalons for solar observation are used to eliminate light from the bright photosphere, allowing viewing into the dark H-alpha absorption line, where one can then observe the hydrogen alpha emission of the much much fainter chromosphere, with all of it's magnificent activity of flares, prominences, filaments, etc., which is one of -- if not the most compelling thing -- to see in astronomy. Tuning allows one to compensate for changes in temperature, altitude, and tune off-band to see Doppler-shifted events. Edited by BYoesle, 02 November 2014 - 07:29 PM. Bob -- excellent educational post. Confirming a lot of what I already thought I knew and adding to that knowledge -- always a good thing. Very informative and well-written post, Bob. Thanks for sharing your knowledge with us. No matter how much I read about H-alpha systems, each time I pick up something new that I didn't quite comprehend before. So you've discussed the etalon itself -- do you plan to continue to the other components of an H-a system? The other filter components can be grouped as in this rather crude drawing, and are essential to almost every narrow band filter system regardless of etalon location. An energy rejection filter - ERF - is used to remove harmful infra red (IR) and/or ultra violet (UV) from the filter system. Ideally, especially for near IR (heat) it is placed as the first element of the system, and prevents thermal effects from degrading performance, and prolongs the life of downstream filter components. The ERF can be made of red colored glass for UV only blocking, colored glass with IR blocking, or optical glass with UV/IR blocking. Next, the etalon as described above, is a "comb filter" which allows the primary narrow wavelength of interest through, as well as multiple harmonics of this primary frequency/wavelength of light. After this, a blocking filter is required to block the etalon harmonics. It can also have additional filtering for IR (an induced trasmission filter - ITF, KG heat absorbing glass, etc.) just ahead of it for near &/or long IR suppression. The filter substrates found here in the blocking filter are often chosen to render a comfortable final brightness level. The main blocking filter is usually a dielectric interference filter with a passband wide enough to allow etalon tuning to occur, but not so wide as to allow the etalon side band harmonics through. The end result of this complex multi-component filter system is the passage of a single etalon peak of the intended wavelength and bandpass desired for observation: Out of a visual spectrum ~ 400 to 750 nm wide -- and much much wider if you consider the UV to IR blocking from 200 to 3000 nm -- only a small sliver of light less than 0.1 nm makes it through and is rendered safe to view. This is also why these systems are very expensive compared to traditional filters used for nighttime observation, or wide band continuum filters designed for white-light photospheric observation. From my perspective, the expense is more than worth it, as I find the chromosphere and it's features unbelievably beautiful, and ever-changing -- comparable to nothing else observed in the sky. To see prominences just around the limb of the sun used to take a much greater filter/telescope expenditure. Now you can see the entire disk as well, at a much higher level of detail and contrast, for much less than the cost of the prominence-only telescope of a few decades ago, or of traveling to see one total solar eclipse... and you can see the chromosphere's features at your leisure, anywhere, on any clear day, from the convenience of your home. Edited by BYoesle, 03 November 2014 - 03:30 AM. Thanks for the very informative post Bob, a very interesting topic. Is the difference between say 0.8 and 0.7 A noticeable, would surface features be less contrasted and proms brighter at 0.8 A, or is this much of a difference in band pass not as noticeable as from 0.7 to 0.5 A.
I might add with a single cavity filter. The index of the spacer makes a difference how much the peak will broaden out with the same focal ratio. For an example, lets start with two etalons, .5Ang at F/70 one with the index 1.8 the other 1 (air). We put both in a F/30 beam. If we measure the HW the high index would measure about .65 Ang the low index would measure about 1.2 Ang. So the higher the spacer index the less effect angle has on the bandpass HW. Also when you put two single cavity filters together you do not change the profile. A etalon is Lorentzian in shape. The profile has long side bands and comes to a point. When you double stack the profile stays the same the side bands are suppressed and you get a better noise to signal ratio ( better contrast). A two cavity filter has that Gaussian curve where the top is rounded at the top and the side bands are tighter. If you where to measure the etalon at 1% it would measure 10X the HW where an 2 cavity filter it would be 3.5X the HW. are normally used it broader filters. In my experience, the differences between 0.7 Å and 0.8 Å is marginal, and not nearly as great as the difference between 0.7 Å and 0.5 Å. But as noted above, if the reduced bandpass is due to double stacking (e.g. a "double cavity" filter), then the difference will be much greater due to the suppressed tails of the transmission curve. The result in that case is greater out-of-band rejection, virtually eliminating continuum energy from the photosphere, and much greater contrast improvement than occurs from narrowed bandpass alone. 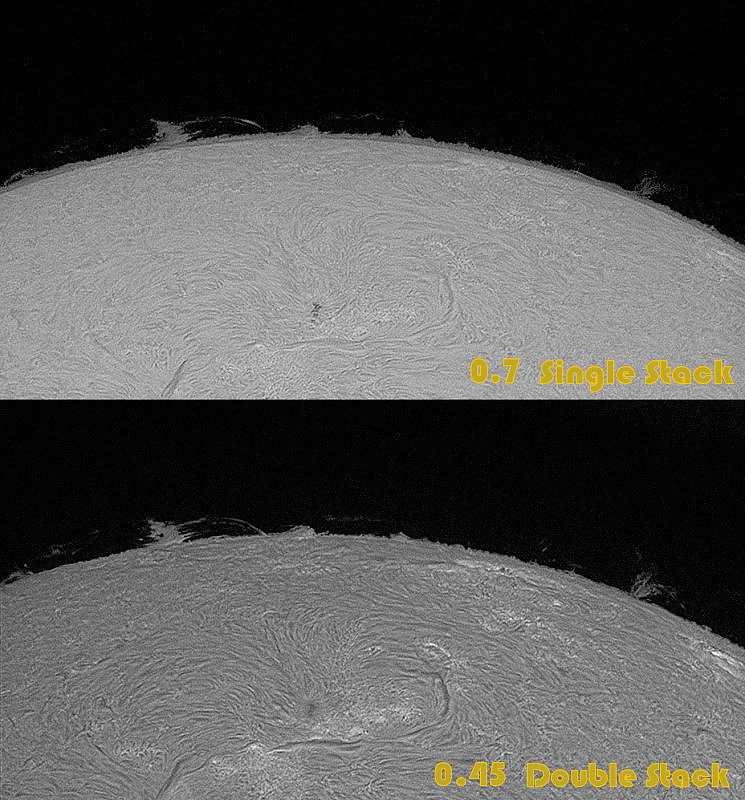 Some people are of the belief that a wider bandpass shows prominences better, and theoretically it might provide more visibility of Doppler shifted prominences. But in my experience this is more a function of overall image brightness, and as the image below shows, most prominences in general are just as visible at a reduced bandpass as a larger bandpass. Therefore bandpass alone is not the defining criteria for filter performance, but as previously indicated, filter construction and implementation also has a great effect on real-world filter performance. Edited by BYoesle, 05 November 2014 - 09:15 PM. Edited by BYoesle, 05 November 2014 - 10:07 PM. I love this place. I learn and learn and learn. Great post! Thank you all. Great post; I really appreciate the detailed info. What is the typical gap spacing distance between the mirrored etalon discs? I understand that you are saying bandpass is function dependent on gap spacing and reflectivity. Does this then correspond to the degree of constructive and destructive interference results? So, in essence, a perfect H-alpha etalon would have perfect constructive interference on H-alpha line due to gap distance and have perfectly moderated reflectivity such that enough light is reflected to cause constructive interference while passing enough light for the observer to see? To the best of my knowledge, the distance between the mirrors (the etalon gap) for the central or target wavelength would have to be exact multiples of the wavelength for the given conditions and materials (temperature, refractive index, etc. ), which makes the reflections "in phase" and behave constructively. Thus for the target wavelength of 656.28 nm for the H alpha emission, the gap would have to have an exact multiple of this distance for the given temperature of the gap material and the refractive index of the gap material. Since temperature and refractive index can vary, it is again important to be able to tune the etalon as previously discussed, either by tilting (changing the gap distance path) or temperature & air pressure (refractive index) changes, or actual gap spacing changes via mechanical pressure on the spacers. For example, tilt-tuned etalons are often made to be slightly shifted to the red wing of the H alpha line, and then can be tuned to compensate for temperature and altitude variation by tilting, which blue shifts the etalon's passband to be on the H alpha center line. Thanks for your very in depth reply Bob, much appreciated. I agree with Bob, there is not much difference between an .7Ang and a .8Ang. A lot of images I see they claim to be .7Ang but are really closer to .9-1Ang. You can tell by the way the disk looks. With processing the image, you can make the filaments darker then it looks like a narrower filter. To me .8 +/- .1 ang are pertly much the same. When you drop to a .5Ang the contrast is improving. There is a good step when you drop to .3 ang.. To get narrower or even to .3Ang you really need to be at F/45 or higher depending on the HW of the etalon in an telecentric beam. If you use a collimated system, then the (sweet spot) will be only a small area in the center at these narrower HW etalons. If you are using a barlow or telecentric or just stopping down the scope you will never get narrower then .3Ang regardless the HW of the etalon if you are faster then F/35. When it comes to double stacking both etalons HW does not need to be the same to show improvement of contrast. You can have an .8Ang and a .7Ang and it will look narrower then just the .7Ang single etalon. But as you add more elements you increase the chances of internal reflection. You also now need to be tuning two etalons to keep it on band. But once it is set correctly the contrast will improve. The gap between Etalon plates needs to be close but not exact to the interger spacing of the wavelength you wish to transmitt because you can tune the transmission using a couple of ways. Tilting is one common method. The other is to change the refractive index of the material between the gap, ie pressure tuning. A third is to change the spacer thickness which is done with piezoelectric material. The forth is to temperature control the Etalon to cause a slight expansion of the material to tune the system. When they make the plates they also can tune the thickness of the reflective coating applied to tune the system. This allows the plates to be matched to spacers of a certain thickness. What is critical is that the plates are very flat and perfectly parallel. That is why the spacers thickness and uniformity in thickness is critical in air spaced etalons. It is also why the spacer are optically contacted to the plates ie no glue just molecular forces since the plates and spacers are so flat the molecules will bond to each other. Spacer fabrication is as demanding as Etalon fabrication. Mica is used for solid etalon because it one of only a few materials that can have areas that are optically clear and when it cleaves it cleaves along crystal boundaries layers. This results in perfectly flat surfaces and also parallel surfaces. The semi-reflective coating is applied to both sides of the mica to form the Etalon. So the interference process takes places inside the mica vs an air spaced Etalon were in happens in the air gap. some of it is personal preference two. Looking at the photographs posted between the single and double stacking 90mm, I personally don't think it is that big of a difference. Some would argue with me, but judging from what I've seen in person what one person considers to be a big difference another person may consider to be a relatively small one. Don't get me wrong, there is a difference, just what one considers to be a "great" difference may differ from one person to another. I have ? when you put an IR filter to help with heat cycling is it put in front of the blocking filter? And what kind should be used I want to make the blocking filter last. The scopes im using are a SM 90 and SM 40 BF 5 and 15. Yes, the IR blocking filter should come before the blocking filter. Best would be a Baader or Lunt ERF replacing the SM90 / 40 ERF. Second best would bee an IR or IR/UV filter placed in front of the blocking filter. to reduce thermal load/cycling. Bob thanks Im going to get 2 this way they might last longer. Are they available from places like Astronomics or High Point that screw in where the threads on the BF are? These fouroms are great so much info to learn from all the posters and experienced users! One ? Would the lumicon uv/ir filter be ok? Edited by germana1, 08 November 2014 - 11:20 AM.